Thanks for your insight on the Tamarisk tree, and for your challenging question at the end. I’ve been reading 1 Samuel and Tamarisk tree stuck out to me. I read again today in 1 Sam, that the bones of Saul and his sons were buried under this tree. I decided to check out blueletterbible.com and also google tamarisk tree to get more info. You mentioned that the only place Scripture mentions the Tamarisk tree was in Genesis, but it is also mentioned twice in 1 Sam. Just wanted to share that with you. Thanks again for your insight and charge to be others-focused. [ Saul Kills the Priests of Nob ] Now Saul heard that David and his men had been discovered. And Saul, spear in hand, was seated under the tamarisk tree on the hill at Gibeah, with all his officials standing around him. Thanks for the posts and the I Samuel references. I was intrigued with the reference to the tree as I read the Genesis account and it seems to me, the tamarisk tree is a foreshadowing of the cross. Abraham planted it to make peace with Abimelech. In I Samuel 22, Saul was sitting under a tamarisk tree when he ordered the murder of the priests. Later, in I Samuel 31, Saul’s bones were buried under a tamarisk tree. From a google search I learned that the tamarisk tree is able to grow in deserts because it sends its roots down deep and can live in saline places where other plants can’t grow. It secretes salt and water. It has little value and tends to crowd out other vegetation. It sends out huge numbers of seeds. The cross also was a tree planted to make peace in a desert-like environment (a sinful world of death). The cross itself is an ugly object of scorn, ridicule and death. The perfect priest of God (Jesus) was killed on it as a peace offering. It represents death (Saul’s bones were buried there). Yet it collects and brings forth living water and the “salt of the earth” in the desert. Its seeds spread forth like the gospel and will eventually crowd out competitors (other ways to God and false religions). Thank you so much for sharing this!! I was reading about Saul’s death and burial this morning under the Tamarisk tree 🌳 and decided to google information on it, this was very interesting! Thank you for the post about the Tamarisk tree. I believe your insight has helped me expand my view on it. I do wonder if I’m missing the point here though, when I read the passage in Genesis, from what I’ve researched about Tamarisk tree’s, it seems to me that not only was Abraham leaving his mark as a sign that “this is the land God has given me, and my family and their family will rest under this tree” but also it was a sign of his covenant with Abimelech and his covenant with God. A tamarisk tree can withstand extreme seasons and natural elements. Like you said, in the Middle East they grow much larger, so it could be seen from a distance. I feel that this tree was a reminder for Abraham and Abimelech for their loyalty to their covenant, and was also a promise for his family that they would rest in the land God had promised for better or worse. I think the significance of planting the Tamarisk Tree is in that Abraham was saying that he trusted God and this was his sign of trust to the Lord, that he was planting something that he himself would not be able to enjoy, but was provision for the promise fulfilled in his seed. The highest significance of Abraham in the Bible is that he TRUSTED God…and it was his trust that caused God to call him righteous. Thank you for the uplifting comments on the Tamarisk Tree. I was researc hing the tree because of the one that is planted next to the stone in New Mexico with the ten commands engraved in ancient Hebrew. It is in San Lunas. You might be interested in reading about it. Thanks Elaine. I’ll look see what the stone engraving is about. I pray that the Lord will show me the seed He wants me to plant for future generations to enjoy. Thanks for your insight on the purpose of the Tree planted by Abraham. it was exactly what I sought. Your insight adapts very well when searching for further understanding for why this type of tree was planted. (I’m studying Blood Covenants in Scripture). In truth, I wasn’t surprised that it was a tree because that was often a sign or memorial confirming a Blood Covenant. God and Abraham ‘cut’ a covenant (the slain animal being God’s substitute) and Abraham made one with Abimelech (with differences). They each one, became permanent partners because the life is in the blood and now their lives are exchanged, meaning what is yours in mine and mine yours and if you have need of something, you can draw from my strength, or wealth etc. Also part of the covenant was the witness (Phicol), the exchange of agreements (promises) , a sign and or memorial. The tree I would call the Memorial. Being a slow growing tree it would last into succeeding generations and be well watered! (Covenants can be generational: consider Mephibosheth. “Consider others as better than yourself” goes along with your call to think of others in what we do. (Abe’s family was protected for a long time by this covenant- at least two generations of Abimelech’s). (Genesis 21:22-34) ps These Covenants are NOT treaties. Sorry for the length of this, you may edit. @Joan – If you have not already read them, I highly recommend Michael Horton’s “God of Promise” and Meredith Kline’s “Treaty of the Great King: The Covenant Structure of Deuteronomy” when researching covenants; excellent work here by both authors. why the word tamarisk is not mentioned in KJV ? I’ve got several of her books, including this one, I think and really need to find the time to read one. I wish I could get away to a deserted isyded.bnrmuaaonion(Kathl)Â´s last post ..
How I enjoyed reading all of the comments regarding the tamarisk tree. 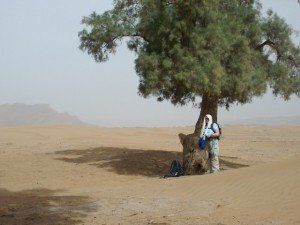 I am studying Genesis and wanted to find out more of the significance of the tree. These comments have been very interesting. God is so good. It’s amazing how He ties everything together of us in His word. I am also studying Genesis and I had to stop for some reason to search for the meaning of this Tamarisk tree. There is something to say about trees and how incredible they are just by itself. In a more simple way to look at this passage I remember throughout my childhood my parents planting lots and lots of trees and i know that there many this day that are enjoying the fruits of their labor. Resently my husband gave me a garden, in the backyard of our house we live in for 20 years, with 28 trees in it. All I can say is that I never felt so connected to this placed as I do now. Maybe there is more to understand and learn about trees. We were made to live in a garden so maybe inside of us trees make us feel like home (where the tree of live is). Is this photo of the Tamarisk tree taken in Israel or where? A friend of mine just commented that the Tamarisk tree they stood under in Israel was incredibly cooler than the surrounding area. Is it possible that we could use the photo in a book for Translating the Bible into other languages? You can use my email for a response. This is the center of the first American Flag and the words “APPEAL TO HEAVEN” at the top, the author of Appeal to Heave Book, Dutch Sheets of Dutch Sheets Ministries of Dallas TX. Has discovered that in the beginning of our country USA, our fore fathers looked to God for religious freedom and made a covenant with God to raise this country up to spread the gospel to the nations. Demonstrating the love of Jesus to all man kind that He died for you. Of course that was perverted through all of our history by sin and wickedness of mans heart. But we can still repent, just like Abraham and David, we to can be the apple of Gods eye. If we repent from our wicked ways and call upon God. Thank you so much for sharing your insight regarding the tamarisk tree I was intrigued when I was studying the scripture in 1 Sam 22 and again 1 Sam 31 ,like all of you I decided to google it….but I wasn’t aware about this tree mentioned in Gen 21 as well so thank you. Above all I was challenged about your comments regarding leaving a Legacy for the next generation. .woow! what a sermon! Lastly just a thought speaking about the covenant regarding your reference in Gen 22 about Abraham, is not also the same train of thought regarding David and Jonathan covenant hence his bones were buried along with father under tamarisk tree. I’don’t mind using my email fot further comment. I also enjoyed reading these comments =after reading different commentaries this afternoon on this point -ie why did Abraham plant the tamaarisk tree 9some commentators think the word signifies a grove of trees I want able to come to much of a definitive conclusion-2thingsthat seem to be true or are true :One the planting of the tree must have been significant to himself -maybe he thought he had found a place to settle down for a while and planted the tree with that in mind -pretty sure bet that he had shade in mind -even if it was for the future -maybe he was planting the tree thinking he would go outside and sit under it and pray to the Lord as a special prayer place?Whatever the sugnificance I was drawn to the statement because it seems like its there as some kind of meaningful thing. Your article and comments are so informative, I enjoyed reading them. In my study I have seen also that the tamarisk was both sign for his peace treaty with Abimalech and mark of his trust to God of the promised inheritance thus he called upon God as witness to the treaty. Note Abimalech brought Phicol as witness. Great resources, thanks to all. I just moved to a street named TAMARACK, as I was studying my Bible this morning, I read about the planting of the Tamarisk tree. I feel that the LORD has moved me here; lots of trees – the Raintree is here too. I’m taking the Text Studies in Midrash, Mishnah & Gemara class at JUC in Israel and our teacher, Rabbi Moshe just taught something on the tamarisk tree I never knew. He said the Hebrew word for tamarisk is אשל (eschol). It is an acronym for א-achila (food), ש-schtiya (drink/שתייה) & ל-levaya (accompaniment/hospitality/לִוּוּי). The tamarisk/eschol tree that Abraham planted was meant (in midrash) to signify all these things for generations to come; food, drink & hospitality. Also when the spies bring back the huge clusters of grapes & pomegranates it’s from the Valley of Eschol! In modern Hebrew eschol is the word for a business expense write off. So fun! The Text is SO rich! Yes, the article (and comments) are enlightening. An additional “twist” to this though. Other places where “grove” is translated (KJV) is Strong’s 842. This is translated in other versions as “Asherah” which was a Canaanite goddess, allegedly originally the counterpart to Baal. Apparently too though this goddess had different names all over the near east. Interestingly though, she was also represented by a tree or grove of trees. Now some people interpret this as the counter part to the tamarisk tree; although it doesn’t come from the same root Hebrew word. This word has a male root “Ashar” which means “to go in a strait line”. Now some Hebrew scholars say Asherah was Yahweh’s wife. (Which actually doesn’t make a whole lot of sense if you have a famine version of a male root word.) But anyway: it’s alleged that “Queen of heaven” as referenced in Jeremiah is a reference to this Asherah goddess. Now the Roman Catholic Church picked up the title “Queen of heaven” and applied it to Mary back in the 5th century. Backing up further though, around about the middle of the 2nd century Mary was given the title of “Domina” which is the feminine version of the latin word for “Lord”. So interesting that this Asherah goddess who was alleged to be the wife of Yahweh; reemerges in the 2nd century as female version of “Lord” later dubbed “Queen of Heaven”. Hum…. may we all think about that one a bit.